Velvets have been woven since at least the ninth century and by the tenth century production of the cloth had become established in Moorish Spain, Eastern Europe and the Middle East, with the best weavers derived from Turkey Cyprus and Greece, and Cypress. The French invasion of Cyprus in 1266 led to the artisan weavers of that island fleeing to Lucca in Italy which then became a major centre for its production. The first English reference to velvet is that in 1278 when the tailor to Edward I paid a hundred shillings for an upholstered velvet bed in Paris. It subsequently became increasingly popular amongst the nobility for drapery, upholstery and clothing. Its use was, however, limited to the wealthiest noblemen: it was at this time woven by hand using a very labour intensive process it was very expensive. Fortunately, these days, Loome fabrics can offer much more reasonable prices for products which still have that air of nobility! Velvet fabric is still the most prestigious of all fabrics. In this cloth cut threads are evenly distributed with a short dense pile, giving a distinctive soft luxurious feel. The dense nature of the tufts makes velvet very durable - being suitable for heavy domestic use. Traditionally, velvet was made from cotton or silk: silk being the most elegant and expensive with a shimmering appearance; cotton being more durable with a softer sheen. Modern polyester velvet fabric closely simulates silk velvet, yet is a fraction of the price and much more durable and stain resistant. All velvet fabric has what is known as a `nap"; when you run your fingers down the length of the fabric, it will feel smooth in one direction and rougher in the other. The appearance of the cloth is governed by the nap, appearing darker in the direction in which the nap runs up. When velvet is used to cover a sofa or to make curtains, the nap should run in the same direction on each piece of the item. Crushed velvet fabrics have nap which intentionally runs in several directions, giving a sumptuous look and making them less prone to pile pressure (Pile pressure is an alteration in the nap of the fabric, visible as a change in shade of the fabric in the area affected, which occurs in any tufted fabric if it is consistently pressed down in one direction or place). Upholstery velvet has excellent durability. Even so, to keep it looking good it is helpful to vacuum it occasionally using a brush attachment. This reduces the build up of any dust which could otherwise dull the colour of the fabric. Velvet upholstery fabric is quite resistant to stains, but any spills should be wiped up immediately, and the area cleaned with a damp cloth using, if necessary, a little mild soap. 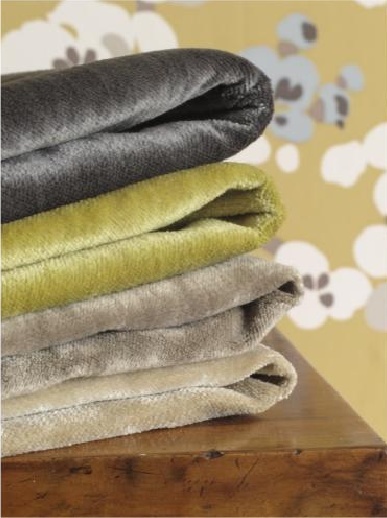 Many of our velvets are also washable. As with all fabrics, care should be taken to try to avoid leaving the fabric in strong direct sunlight as this can cause fading. Similarly, one should avoid direct heat such as leaning the fabric against a radiator. Never iron velvet as this will crush the pile and may result in permanent imprinting of the fabric. Velvet is the ideal fabric for curtains. To see full details of any of our elegant velvet curtain fabric simply select the image on the right. Velvet curtain fabric is one of the best fabrics for curtains: it drapes well, has excellent acoustic and thermal insulation properties (so your house will be warm and quiet) and is hard to crease so remains looking pristine for longer than other fabrics. When velvet is cut to make curtains it is important that each panel of fabric has the nap running the same way, as if this is not done the curtains will not match. Usually the fabric is used so that the lighter shinier look is displayed when viewed from above. Since velvet was originally made from silk, and was extremely expensive, velvet curtain material have always been linked to wealthy period homes and the aristocracy. So if you want to add a little class to your home, use velvet for the curtains. Modern curtain velvet fabric is made from polyester or other synthetic fibres and, as such, is robust and often washable. Polyester velvets, due to their combination of durability and stain resistance, are perhaps the best fabrics of all for resisting the wear and tear of children and pets. Polyester velvet makes ideal stain resistant upholstery fabric and curtain fabric.